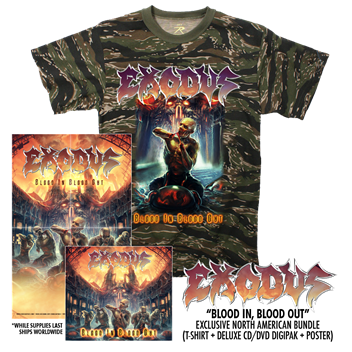 Legendary architects of thrash metal EXODUS have revealed the track listing for their upcoming tenth studio album, Blood In Blood Out, due out in North America on October 14th. 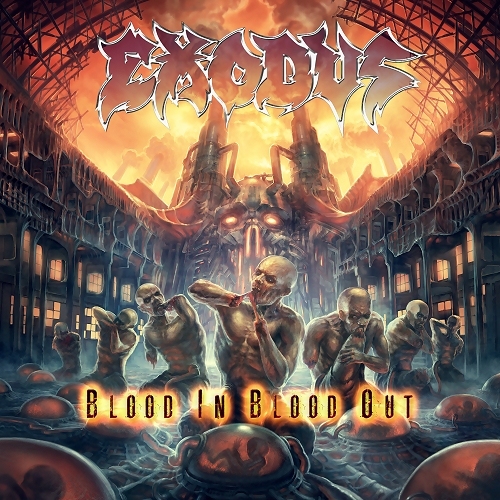 Produced by Andy Sneap, Blood In Blood Out marks the first release with returning vocalist Steve “Zetro” Souzasince 2004’s Tempo Of The Damned and features cover illustration by Swedish artist Par Olofsson (PSYCROPTIC, ABYSMAL DAWN, REVOCATION). The album can be pre-ordered from the Nuclear Blast USA Webshop in CD, digi-pak, and 2-LP exclusive yellow vinyl formats. Bundles include a t-shirt with exclusive artwork for North America + a poster (while supplies last). EXODUS will head out to South America in October before returning for a supporting run in November with fellow metal titans Slayer and Suicidal Tendencies. The Scion-sponsored leg of this U.S. tour launches on November 11thwith two shows at The Fox Theater in Oakland, California. The 26-show trek includes nine headlining off-dates with additional performances to be announced soon. Tickets are on sale now via the links on the official EXODUS Facebook page. Due to the overwhelmingly demand, EXODUS is making their VIP Experience packages available for the entire tour via SLOtix.com. Fans are encouraged to get them as soon as possible, as VIP package sales will close seven days prior to each show day. Due to an overwhelmingly positive response, EXODUS is making VIP experience packages available for the entire tour. The packages are on sale now! Fans are encouraged to get them as soon as possible, as VIP package sales will close seven days prior to each show day. *To purchase VIP packages via SLOtix.com – click here*.